IMPERIAL SHUTTLE An elegant example that stands apart from typical brutish Imperial engineering, the Lambda-class shuttle is a multi-purpose transport used in the Imperial Starfleet. The Empire pressed the shuttle into service for both cargo ferrying and passenger duty. 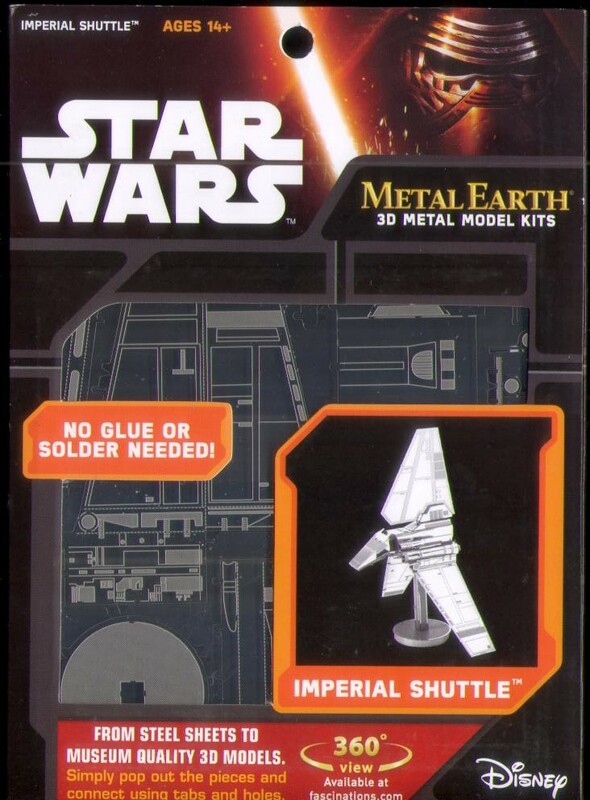 Even the Empire's elite, like Darth Vader and the Emperor Palpatine used these shuttles. It has three wings: a stationary center foil and two articulated flanking wings. When in flight, the side wings fold out for greater stabilization. When landing, the wings fold in, shrinking the vessel's silhouette. The well-armed vessel has two forward-facing double laser cannons, two wing-mounted double cannons, and a rear-facing double laser cannon. It is equipped with a hyper drive. Number of sheets: 2 Sheets Difficulty: Moderate Assembled Size: 10.8 x 6 x 10 cm.